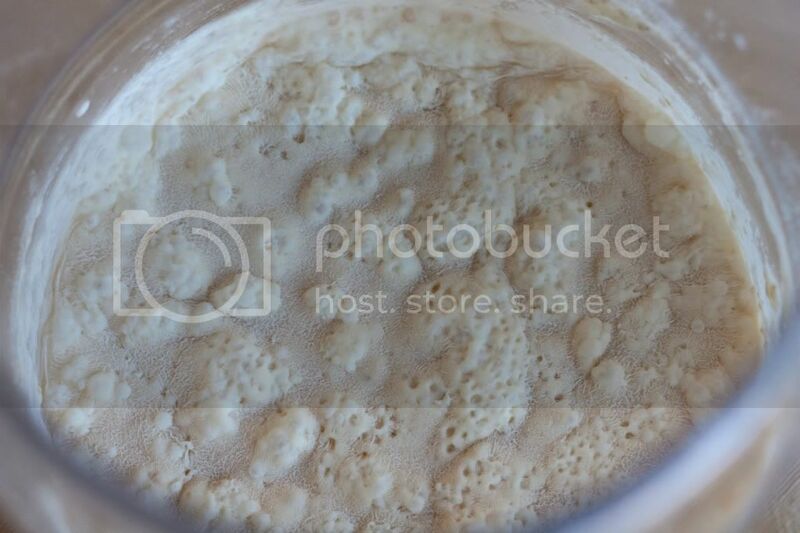 What happened to my starter? Help! A closeup reveals weird looking strands. I have used the starter a few times since this has happened and it works just fine, it rises and falls after a feeding, smells normal but it just looks like...well this. I'm just worried that I should toss this batch and begin a new starter. I have thoroughly cleaned the pitcher but I wish I would have noticed the green substance before feeding my starter. Has anyone else run into this sort of situation? Would feeding it pineapple juice resolve the problem? Any help would be greatly appreciated. Thank you! First off, I would start a new starter using Debra Wink's pineapple juice solution immediately. This is so that, if you try to save THIS starter, and it fails, your new starter will already be several days under way. Using Debra's complete instructions (from pineapple juice part 2), you'll be good for about a week or so. After that's on the counter and starting, you might try to save your old starter by 'washing' it, which simply means, use an -extremely- small sample of the old starter, taken from like the middle of the polluted culture, and adding it to a normal feed. This small sample can be 1 gram or even less, to say, 40 or 60 grams of refreshment. Use a different container (obviously), and I'd recommend plain old tap water at first. Something slightly chlorinated and hardened with minerals will probably help combat whatever cheesiness or mold may be in the small sample. Watch your refreshed starter and refresh again with a normal sample (say 2:1:1) after it's at least doubled, but not peaked. Do this for a day or two, and then revert back to 1:1:1 maintenance every 12 hours (let it peak and crash) and see if behaves and smells correctly. You can also go back to a filtered or bottled water. This old starter, if able to be saved, should be back to normal health within 3-5 days. If at any point you still see signs of pollution, I'd pitch it and focus on the new starter. If you save it, you can go back to your usual maintenance and storage procedures you're comfortable with. Did you get sick from it? The vast majority of food poisoning is instant or very nearly so. You should feel an effect of some kind within 24 hours. On the outside, certain rare kinds of foodborne illness can produce symptoms after 3 days or more. These illnesses are from meat and pathogens borne by livestock or, much more often, wild game. If it's not making you sick, I wouldn't worry about it. But that's me. My thoughts are that your starter is perfectly safe and even if it had a little alge it it, it would probably not be harmful. I'm no authority and I'm just guessing. Thank you all very much for your advice and comments. I have just decided to begin a new starter, it's going to take a while so for the time being I'm just going to continue using this starter until the new one is ready (we eat a lot of bread in my house, about 5-6 boules a week). I didn't know that I could sterilize using vinegar (which I will do from now on) so I sterilized the pitcher by soaking it in a bleach solution, I didn't want to take any chances. My previous pitcher (which was a few years old) had the same fate so I just recently bought this pitcher; I don't know what is causing this. Mr. Robertson's method of maintaining the starter is pretty much "washing" it everytime bread is baked. His method states to take a tablespoon of old starter and adding it to a large portion of flour and water, only half of which is used to bake the bread, the other half is the new starter. I've done this many times and everytime my starter still becomes this hideous and veiny thing. I haven't gotten sick from consuming it and it tastes just fine. Thanks again folks! How much is "a large portion of flour and water" that you are adding this tablespoon of starter to? it's 1 TBSP of starter to 200 grams flour (50/50 A.P and whole wheat) and 200 grams water. Click here: AOL Image Search result for "http://howardhughes.trinity.duke.edu/uploads/assets/image/Christine Kim/colony morph. 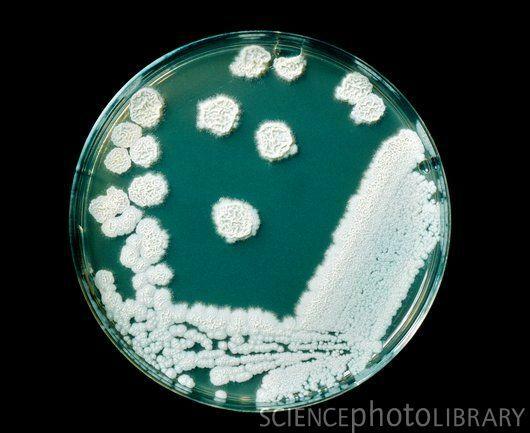 Click here: AOL Image Search result for "http://openi.nlm.nih.gov/imgs/rescaled512/2739428_pgen.1000664.g004.png"
This one is Candida krusei. 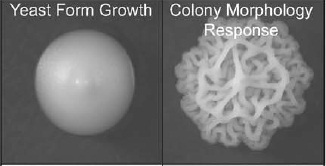 The colonies have spread and grown into each other more, making it easier to see the similarity in texture to your photo above. The areas that look like corals rising up throughout in your photo are probably just where the CO2 gases are bubbling up underneath this blanket, no? The pH range for most cultured algal species is between 7 and 9, with the optimum range being 8.2-8.7." Herein lies a problem. The Robertson method of diluting a starter which probably is never allowed to build up any significant acidity to begin with, may be raising the pH into the range that allows growth of this algae. Especially if your tap water is alkaline as well, as many are. This may be a rare combination of factors, but the result is kinda cool to see. Thank you for posting these photos. "Light is the most limiting factor for algal growth, followed by nitrogen and phosphorus limitations. Algal productivity is often correlated to levels of nitrogen (N) and phosphorus (P)"
I know you started over, but if you find it happening again, it shouldn't be too difficult to banish algae from a starter by using algae-free water, letting the acids accumulate so that the pH becomes inhibiting, and keep the starter in the dark until things turn around for you. How have things been going since? Not Jimmy here, but thanks for sharing your research again, fascinating! I think I may have seen this on a starter of mine in the past, either in a creation state, or a too-long-in-the-fridge state. Nice to know that it's not harmful. It also struck me as familiar. since seeing this post about 2 yrs ago. Also Cranbo's comment "too-long-in-the-fridge" state. Although I remember seeing it weeks into refrigeration with an untouched tightly covered 100% hydration rye starter. I would have thought the slowly increasing acid would keep the starter "in check." Debra, do you think the shift of colony formation get started earlier on when the yeast numbers were small and the starter is stored too soon in the fridge after feeding? Or later on when the yeast had to adapt to lack of nutrients and nitrogen? Algae was not in my equation and that may be the major difference. Out of curiosity... would nitrogen gas layer under carbon dioxide? I'm thinking that as CO2 gas is coming off the starter, it is the heavier gas and any loose nitrogen is forced to the top of the container just under the lid. With a tight lid (no holes) no stirring of gasses occurs. My correction at the time of seeing these colonies was to get a starter sample underneath the "skin" of the starter and continue feeding but let the starter ferment longer (let yeast numbers build and pH fall) before chilling (and without realizing it) remove the lid when I check on the starter more often during long periods of storage to circulate fresh air removing the CO2 gas. It did help I didn't know the science at the time. So far, lack of gas exchange doesn't seem to affect my dry or firm starters. I suspect there isn't enough moisture for such cool surface formations. Thank you for keeping up on this topic and adding to it. I'm not the original poster either but I do lurk around trying to fit puzzle pieces together. Very much appreciated! I was living with a slight fear of these colonies reappearing on my starter. This is great information, thanks for following up. I think this helped solve my mystery! Hi! 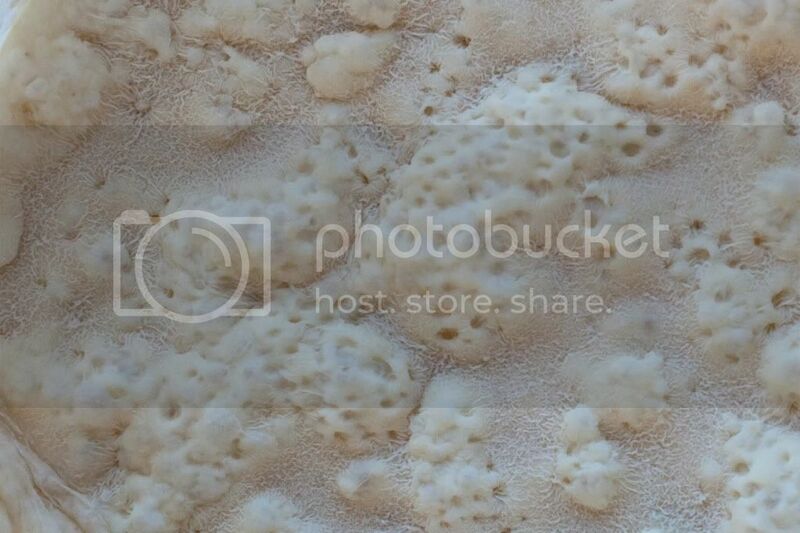 I just posted about an issue i just discovered with my starter that had been left in the fridge for about a month. I'm putting all the pieces together and I think this thread has solved my problem. It sounds you have a good grasp on what this growth is and I wondered if you could help me pin it down. I too used the Robertson Tartine starter method and have baked with it twice and then refrigerated it for a month. The lid was on much tighter than i thought when I returned to it and I was surprised to find these strange formations. The smell is mild and yeasty at most. I immediately thought it was harmless just based on the coloration but I was too afraid to just scrape it off and revive the starter. Could you take a look at this picture and perhaps weigh in on how you would proceed? Also the algae bit threw me off because I used still bottled mineral water so I thought that would be a stretch. I thought your theory on the gases layering was perhaps right on since the lid was on tighter than usual. Thanks I appreciate any thoughts! Thanks for taking the time to explain this in a way that someone like me can grasp it too. Will take my walk now and marvel at the wonders of the microscopic world that keeps us all alive. It will be the coolest bread book ever. Awesome read; thanks. Never knew the yeast we encounter in baking was polymorphic, or that algae may trigger the polymorphism. I remember seeing it weeks into refrigeration with an untouched tightly covered 100% hydration rye starter. I would have thought the slowly increasing acid would keep the starter "in check." 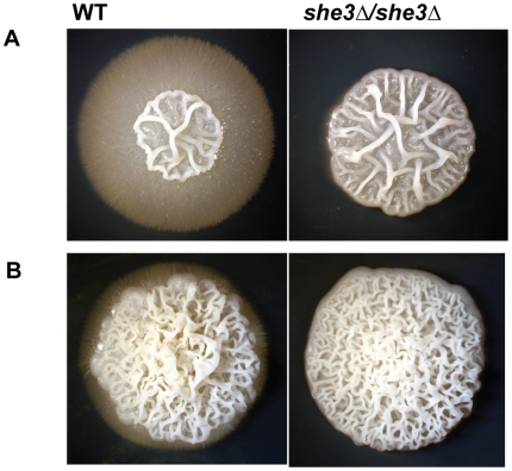 Mini, keep in mind that this yeast trait isn't directly influenced by pH. Most sources site insufficient nitrogen as the primary cause, especially when there are plenty of sugars available. ...I'm thinking that as CO2 gas is coming off the starter, it is the heavier gas and any loose nitrogen is forced to the top of the container just under the lid. Yeasts get their nitrogen from ammonium ions and free amino acids. They don't break down proteins, so proteolytic enzyme activity in flour would be something to look at in the absence of other conspicuous causes. Algae in a Brita bottle? I've never heard of that before. I use a Brita-type filtre bottle and have never seen anything resembling algae in it.